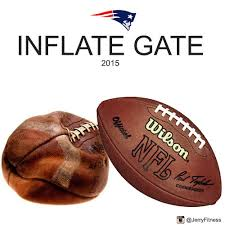 Are you sick of Inflategate, the football controversy where allegedly the New England Patriots gained an unfair advantage because a mysterious someone let 2 pounds of pressure out of 11 footballs used against the Indianapolis Colts? Shocking isn’t it? A pro football team trying to get every advantage in a game that wasn’t even close! Isn’t this the most important news since the death of Osama bin Laden? You think that nothing else happened in America. What are our priorities? This same week marked the 42nd anniversary of Roe v. Wade. Once again, about 400,000 people marched for life in Washington yet the weekend version of USA Today ignored it. The [abortion] death toll approaches 58 million yet Inflategate is much more important. Neither Hitler nor Stalin was responsible for so many deaths. That should be shocking. Abortion killed more Americans than all of our wars put together. Abortion killed 1000 times as many Americans as the Vietnam War so why isn’t Liberal America trying to stop it? Over a third of all African-American children have been eradicated by Abortion. Where are the Civil Rights leaders fighting for African-American lives? Where are the athletes who supported the protests in Ferguson and New York? Why don’t these black lives matter? What kind of people have we’ve become where the air pressure in a football is considered more important than the life of a child, never alone thousands a day. Why were these footballs more important than the atrocities committed by Gosnell and other late-term abortionists? Doesn’t all this make you proud of the American media?